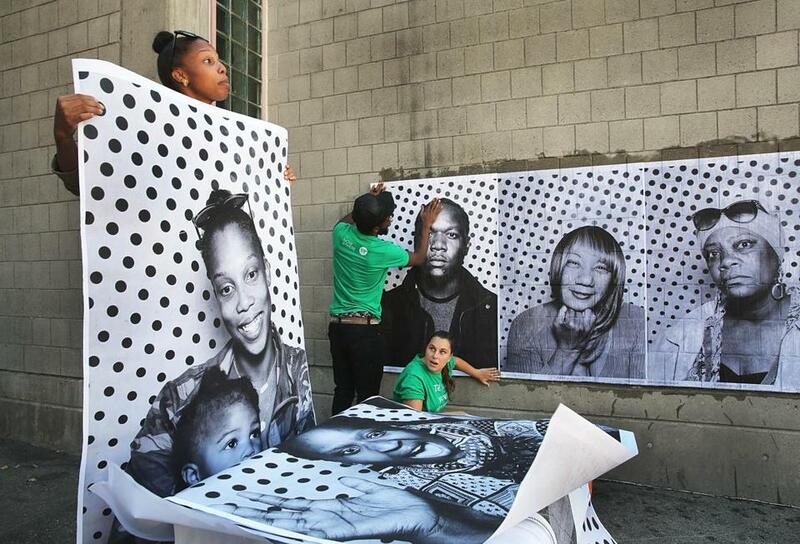 Aziza Robinson-Goodnight held up a giant xerox photo of herself and daughter August, 15 months, as volunteers pasted pictures of neighborhood residents on a wall outside the Boston Public Library in Roxbury. Cassandra Selmon watched from a bench at the Dudley branch of the Boston Public Library as volunteers dragged brushes slathered with a paste across an image of her face on the building’s wall. Satisfied with the portrait’s position, the volunteers quickly moved on to the next picture: a candid shot of Selmon’s goddaughter, Kimberly Wade, her fist beneath her chin. Then they pasted the next image, the face of a man whom Selmon thought she recognized from the neighborhood. For the volunteers, the photos were part of a larger community art project launched by French conceptual artist JR called “Inside Out.” For Selmon and her goddaughter, they were visual proof of their place in the Roxbury neighborhood. More than 70 people lined up and had their photos taken in the “Inside Out” truck at the library on Wednesday. Once the portraits were taken, they were printed on large pieces of paper and applied to the gray cement walls using wheatpaste. Volunteers Jennifer Guarracino, left, and Martina Tanga gathered giant xerox prints of residents whose photos were taken as part of the Inside Out Project outside the Dudley Branch, Boston Public Library in Roxbury. The project seeks to create a sprawling mural of anonymous portraits that crawls across the building’s facade, quietly telling the stories of the people who work and live in the area. Boston has seen a recent surge in public art, with prominent works popping up around the city. Consider the sheep floating in the Fort Point Channel, the enigmatic mural of a man on the side of the former John Hancock building, and the colorful netting draped above the Rose Fitzgerald Kennedy Greenway downtown. But “Inside Out” gave people the chance to become directly involved in the outdoor art excitement. “People are out here smiling, and laughing, and talking to each other,” said Kate Gilbert, director of Now and There, a nonprofit arts organization. Gilbert’s group brought “Inside Out” to Boston with the help of Roxbury’s Up Truck, a mobile art lab. On Thursday, the photo booth truck will be parked outside Back Bay Station to create a second mural. People’s personal tales of “resilience and courage” are also being collected by organizers and will be documented in a book that will be deposited at the Roxbury library. JR, who is also responsible for the mural on the former Hancock building, launched “Inside Out” in March 2011, during a TED conference in California. To date, more than 234,000 people in 124 countries have taken part in it, in places as far away as Nepal and Vietnam. Each city’s project is archived and documented on the artist’s website. Miguel Vasquez, 21, and his brother Jonathan were driving by the library when they saw the truck parked on the sidewalk. Thinking it was a food truck, they stopped to get some French fries. When they discovered that it was a participatory art project, they couldn’t resist joining. “I want people to see me and people to know that I give out to my community,” said Miguel Vasquez. His portrait quickly went up next to the others. 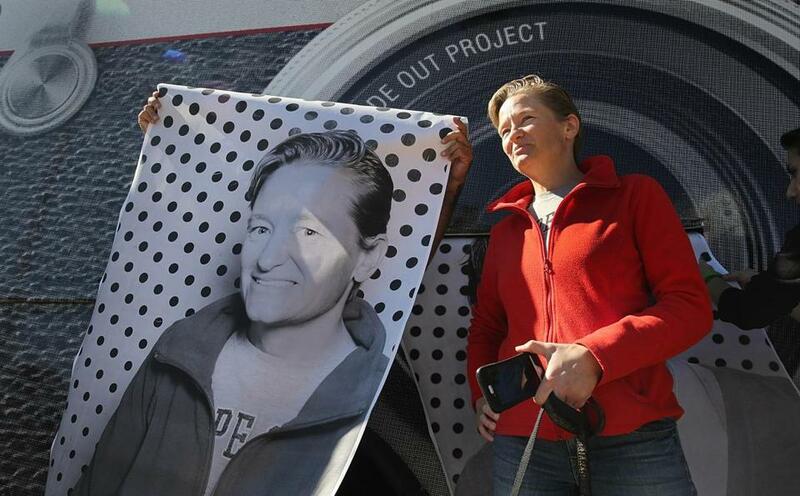 Ellen Wells of Roxbury posed for a picture next to a giant xerox print of herself. Susan Thompson paused as she rounded the corner on Warren Street, where she was met by the large crowds admiring the mural. Alejandra Durban, 19, a junior at Northeastern University, read about the project in Roxbury and saw the TED talk by JR.
For C.D. Storm, the mural and the event took on a different meaning. It offered a reprieve from the crime that sometimes overshadows the vibrant neighborhood, he said.